With your back against the back pad, feet about shoulder-width apart and, if desired for balance, your toes pointing slightly outward, press with your legs, and then release the weight retention handle(s). You are now in the (standing) starting position. Bending at the knees, lower yourself as deep as is comfortable, while inhaling throughout the movement. Press with your legs and raise yourself until your knees are nearly locked out, exhaling throughout the movement. Repeat steps 2-3 for as many repetitions as are desired, and, once complete, move the weight retention handle(s) back into the locked position. When the feet are farther forward on the feet plate the gluteal (buttock) muscles are used more. 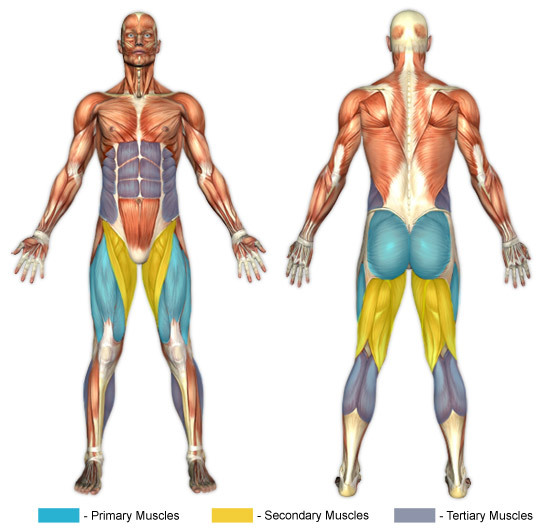 When the knees are more back (beneath the body) the quadriceps are used more. This exercise puts a great deal of stress on the knees and the lower quadriceps muscles. As such, caution should be taken to only lower as low as is comfortable. Even if you experience difficulties lowering deeply, with proper and patient training you may become able to do full, deep hack squats. Also, it is imperative that the abdominal core muscles are isometically contracted in order to protect the low back muscles.